A stream gauging. Many detailed velocity measurements are taken across the stream cross-section. One of the problems with measuring stream flow is that there are few instruments available that can accurately measure flow directly. For this reason, it is standard practice to measure water level (which is much easier to measure), and then calculate flow data from this by means of a graphed curve. To get this curve (called a "rating") requires a number of manual measurements of velocity and area, at different water levels. Because every stream is a different shape and size, this relationship will also be different. The accuracy of the resultant flow data is highly dependant on having an accurate "Rating Curve" that correlates water level to flow. In some cases, it is possible to control the flow of a stream by installing a standard shaped weir or flume. Water then flows through at a controlled rate and the discharge can be calculated from level measurements using a simple equation. Unfortunately, in many situations this is not possible and manual measurements must be made to develop the relationship between level and flow. This manual process is called a "gauging". 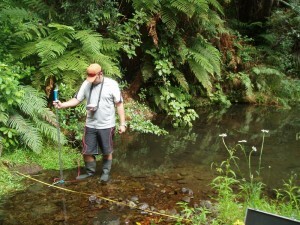 For a gauging, a hydrology technician takes a large number of water velocity measurements across a cross-sectional area of the stream using specialised instruments. Each individual measurement is then used to build up a measure of the flow rate at that particular water level. A separate gauging is required at different water levels so that over time, an accurate relationship can be developed. This relationship is known as the "Rating Curve". The number of gaugings required will differ for each site, but we recommend a minimum of six at different levels. 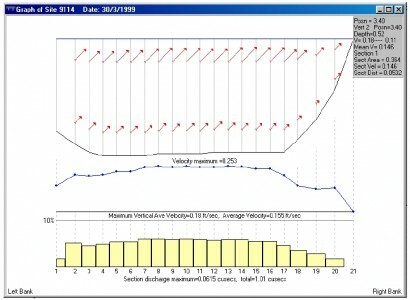 The rating curve can either be applied manually to convert level data, or the relationship can be entered into a datalogger to calculate this automatically in real time. If the stream bed is stable, the rating curve should hold for many years, but if there are regular changes (through flooding, vegetation growth etc.) more guagings are required to check its accuracy. Scott Technical can carry out gaugings and develop a rating curve for your site, as well as carry out ongoing maintenance of equipment to ensure your data stays accurate. Each gauging typically takes 3 hours, including data analysis and reporting. A typical gauging site consists of a manual staff gauge, a control (either natural or man-made) and electronic instrumentation to record water level. The staff gauge is surveyed in so any physical changes to the site, such as washouts, can be referenced back to a single datum. All electronic measurements are also referenced back to the staff gauge to maintain accuracy and allow for errors due to instrument drift and site specific factors such as silt build up. 3.	quote for establishing a gauging site, including equipment, configuration and installation.